Hi everybody! Happy October! Boy this year is going fast! 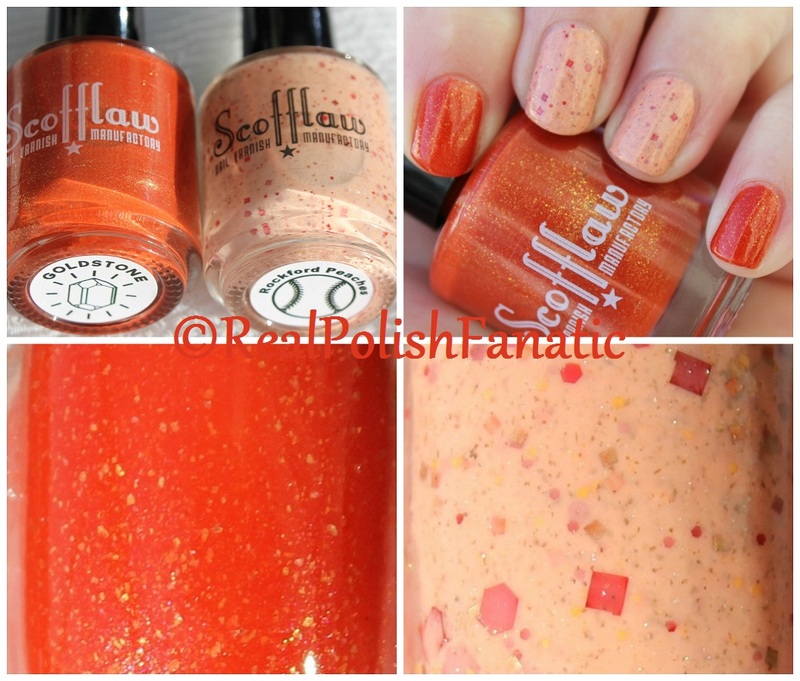 Today I’m showing two more polishes from the Scofflaw 2015 Fall collection. Goldstone is a burnt orange with gold flakes and shimmer. The flakes and shimmer are not “in your face” noticeable, but they are there and add a nice glow to the polish indoors. Formula was excellent. I used 2 coats plus topcoat for the photos. Rockford Peaches is a peach base with peach shimmer and glitters in red, copper, peach and holo. The glitter were a bit harder to get out with this polish. I didn’t see any of the holo glitter until I went outside to take the pictures. I saw a few in the bottle, but none of them made it on my fingers. The formula was very good. It did want to pool a little in my cuticles. I used 2 coats plus topcoat for the photos. to cause a bigger mess once it starts to set. Scofflaw Nail Varnish Goldstone & Rockford Peaches, 2 coats of each plus topcoat.